Serving food on slates has been big in restaurants for quite some time now. It is a great alternative to a white plate and adds creativity and flare to your food presentation. The ‘slate plate revolution’ was borne from the demand for tableware, reflecting a new found respect for artisanal craftsmanship. Plating on a slate is an art and it improves the more you trial with it. Whilst practice makes perfect, there are some tips and tricks that will help you along the way. Here we share our guidance to perfect plate presentation. Why should I use slate as a plate? Slate has been used for cheese boards much longer than it has for plates. But why has there been a sudden rise of this dark and natural material as an alternative to plates? Chefs are constantly striving to find new ways of serving food in interesting, bold and unusual ways to enhance dining experiences. Slate ticks all these boxes. Slate is also strong. Even better, it has a great effect on food presentation thanks to its dark colour as the backdrop. It brightens the food, making it visually more attractive and vibrant. As well as creating a stunning contrast, slate is a fun alternative to using white crockery. This is, however, for you to decide on what concept you want your food to take. Slate handles hot and cold temperatures with ease. It is excellent for serving cold desserts, such as a delicious vanilla cheesecake with a generous serving of ice cream. To stop the ice cream running off, you could present it in a ramekin or even a small bowl. Fresh fish also works beautifully on slates. Salmon always looks delicious. The bright, vibrant pink hue of the fish is striking against the grey. For even more of a contrasting effect, placing your salmon on top of greens such as asparagus and broccoli works wonders. This recipe here looks and tastes fantastic. Okay, so you’re ready to start. Here are some pointers to get you creating a slate plate masterpiece. The first vital thing is choosing a slate which is going to frame your food beautifully. Whilst you want plenty of room, too much can also take the attention away from your food. We stock a variety of sizes of slate, in round, square and rectangular shapes. Think about how the size is going to affect those carrying it. Slate isn’t lightweight, so bare in mind how heavy it is going to be once your food is also on it. This is the most important step. Conjure in your mind the layout of the food. What shape do you want your food to take for your food presentation? Is there a particular order that you want with your food at all? You do not have to have the exact placement in your head, but a good starting reference and idea goes a long way. It will save you time and ingredients. Dotting thick sauces around your ingredients is the finishing touch and will wow your customers. The thicker the sauce, the better, as it stay on the surface. Herbs and spices are a great alternative to sauces. Reds, greens, oranges and whites are wonderful colours to use as they contrast the grey beautifully. Last of all, garnish. Having put all this effort in, garnishing will simply complete your plate presentation. Garnishing tweezers are ideal for placing the finishing touches without knocking your ingredients out of place. Some slate has to have a food seal applied before it can be used. Olympia's range is treated beforehand to save you time and money. Browse Olympia's collection now. If you are working with appetisers, arrange them in odd numbers. Odd numbered groupings with main ingredients are more aesthetically pleasing to the eye. Your dishes will stand out more with the odd numbering and the contrast of colours. 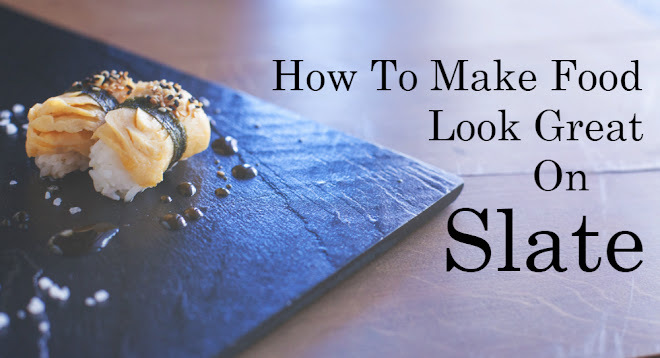 Stay clear of using slate for food that has thin sauces. With the sauces, if they are thin, they will run off the surface and ruin the dish. It will make it hard for your customer to enjoy their food - not to mention for your waiting staff at table service. Are digital scales better than analogue scales?